Hate to do it, but I have to ask this question: Should we just cancel Valentine’s Day this year? Well, if you celebrate the holiday for the candy, you might be on board. A couple of oddities at candy factories in 2019 will have those with sweet tooths a little disappointed. First, the candy almost synonymous with Valentine’s Day, Sweethearts, won’t be around this month. 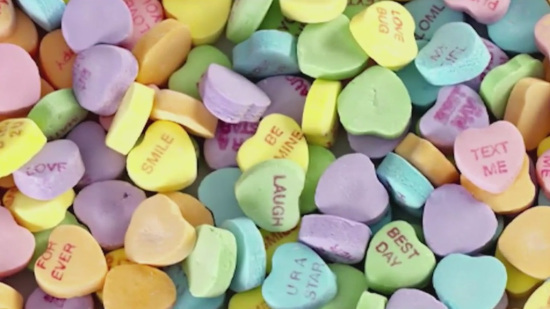 Necco, the candy maker responsible for the treat, shut its doors last year. People who couldn’t envision a February 14 without Sweethearts rushed online to purchase leftover batches of the candy from 2018. But only so much product remained. Sweethearts won’t be around this Valentine’s Day. Just as we were starting to cope with the Sweetheart shortage, more bad news came this weekend. Candy giant Hershey’s admitted to a very serious problem regarding one of its most popular offerings. Due to an equipment malfunction at the factory, Kisses have been produced for the last few months without the signature tip. Hard to envision, right? Supposedly the issue is now fixed but the corrected candy won’t be on the shelves for at least another month. That means a Valentine’s Day with tipless Kisses. Sorry not sorry, you won’t find me taking the news that hard. When it comes to holidays, I think Valentine’s Day is at the bottom of the list when it comes to candy offerings. This might be unpopular for me to say, but I think Necco actually did us all a favor by going out of business. When its top holiday candy is described as “chalky” how can that be a good thing? If your sole purpose for celebrating a holiday revolves around sweets, lacking a significant other on Valentine’s Day is probably the least of your worries. Sure, you can purchase yummy candy that is covered in red, pink, and white wrappers (such as M&Ms and Reese’s Cups) but V-Day simply lacks quality signature items unique to the holiday. It sure isn’t Easter. I hope we can all manage this Valentine’s Day with the recent developments. After all, although the Kisses do look funny with no tips, I guarantee you that they still probably taste like chocolate. Don’t Blink. This entry was posted in Uncategorized by brent. Bookmark the permalink.